• We breathe the same air inside the four walls, potentially inhaling the harmful substances that are trapped inside the closed rooms. Indoor plants improve the quality of air we breathe which in turn dictates our quality of life. • Low humidity levels bring down your immunity levels and make you prone to viral infections. Whereas, high humidity levels increases the vulnerability to other diseases. Bring in one or two indoor plants to control the humidity levels in the normal range suitable for human health. • Studies suggest, indoor plants can reduce cold-related illnesses and allergies by 30%. By increasing the humidity levels and decreasing the dust at home, indoor plants help in reducing asthma, allergies bronchitis. • Stuffy stale air can cause headache. 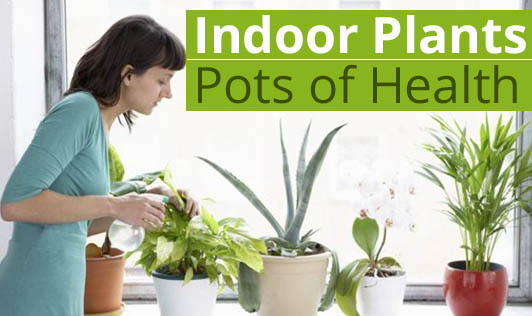 Indoor plants can help to keep you away from headache. • Potted plants and flowers can also improve your mood or help in idea generations and make your brain work better. • Feel the positive vibes and serenity at home with indoor plants around you. • The best way to keep yourself busy at home in a constructive way is to grow and nurture an indoor plant. They not only kill your boredom but also help you to come out of loneliness just like your beloved pets. • Indoor plants have been known to reduce stress and also reduce hypertension. • An indoor plant can also make you livelier and get you out of drowsiness as the high carbon-dioxide levels in the air is absorbed by the plants for photosynthesis. • Indoor plants like aloe-vera can offer a vast home remedies for acne issues and pain relief. • If you are a smoker or live with a smoker, then plants like Peace Lilly at home can remove the airborne chemicals from cigarette smoking. But, this does not give you a free hand on smoking! • You can sleep tight after a tiring day if you have a Gerbera daisy in your bed room as they give off oxygen at night. • Peace lily plants can prevent the growth of molds in the bathroom. • A Boston fern in the bedroom can help moisturize your skin. • An indoor plant can also enhance creativity and productivity at your workplace.